Searching for Bonobo in Congo » In Congo, Diamonds are Whose Best Friend ? This was my first trip to Mbuji Mayi. 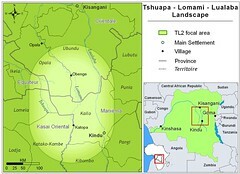 I knew it as Congo’s city of riches: the diamond mecca of the country. But whatever I expected is not what I found. Diamond merchant at open air market in Mbuji Mayi. I flew south, over savanna towards Mbuji-Mayi , capital of Kasai Oriental, a Province whose northern half is forest and important to us because there are still significant bonobo populations along the Lomami River. These bonobos, closest relatives to both chimpanzee and man, are being hunted. 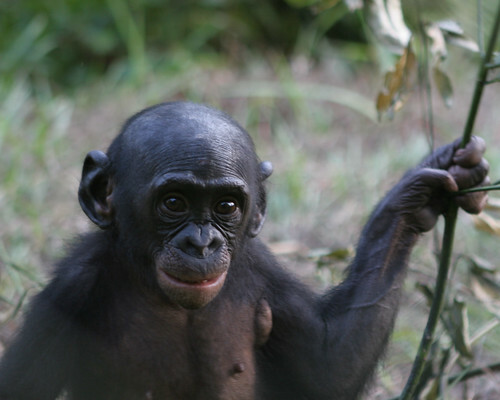 This baby orphan is at Lola Ya Bonobo, the bonobo orphanage in Kinshasa. The purpose of my trip: convince the authorities to support our conservation effort. 1. An administration willing and ready to listen, though not much invested in the forest. Both governor and vice-governor started with careers as parallel-market diamond dealers – now politicians. The governor was cordial and correct. The governor of Kasai Oriental in the room where he held audiences. 2. Those who listened attentively, however, were from the north, those who call the forest their first “home”. Fifty-one merchants, deputies and government advisers came to hear my presentation and they all stayed afterward for an entire two hours of questions and answers. Their concern was heartening. Getting ready to present in Mbuji Mayi. 3. But Mbuji Mayi, itself, was less heartening. It has a layered diamond economy and the top layer – the only layer that could openly enter the global economy – is bankrupt. A third of the world’s industrial diamonds come from Mbuji Mayi. After World War II, it was the number one producer worldwide, all diamonds coming from a single giant industrial mining company, MIBA, whose mining properties cover 45 hectares. A picture of the MIBA field site from a distance. A website maintained by a group of MIBA’s ex-workers states impressively that “to produce one gram of diamond, it is necessary to extract, transport and process 3,200 kg of sand and gravel. Soon after the recent war, MIBA closed down its mining efforts. They are still closed. All diamond mining in Mbuji Mayi is now artisanal… “à la wild west”. The slide in official production started in 1973 when then-president/autocrat Mobutu Sese Seko nationalized MIBA. A few years later 20% of shares were returned to the original company, but the downward spiral was never completely arrested. In 1974 production was 12,990,558 carats. In 1999 production was only 4,732,480 carats. 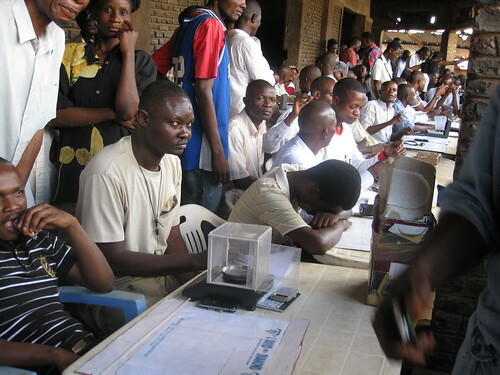 Fraudulent exports throughout the 1990’s are thought to be worth two to three times the value of official exports – and worth a stunning six times the total budget of DRCongo. 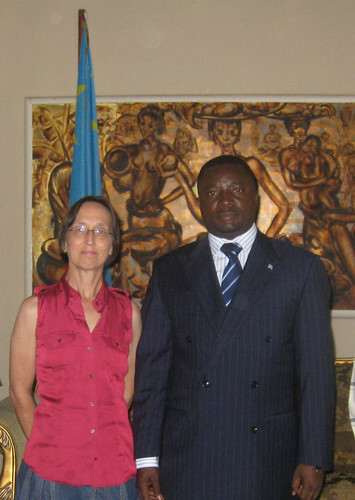 Then came Kabila’s war. MIBA lost 135 million US dollars to the war effort. Blood Diamonds. Starting in August 1998, the government claimed 30-40 per cent of MIBA earnings, regularly taking hold of millions of US dollars. 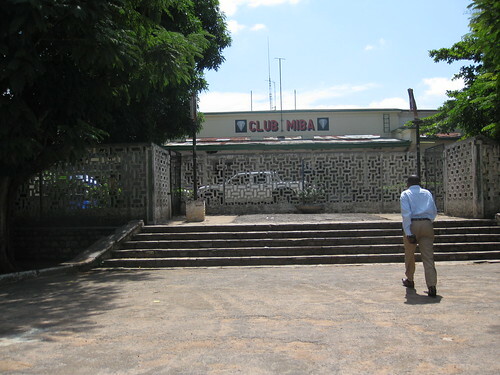 When I stopped at MIBA headquarters and asked for permission to visit their operations, it was politely denied. The very professional chef of operations explained: “Not today. Not a white person. They shot and killed a thief last night — this is frequent . And the place is full of military and police.” Besides, there were no “operations” as such, mining was at a standstill, new investment was needed. All the nicest houses in town were built for MIBA personnel, there was a large MIBA supermarket and a MIBA sports club and swimming pool, all waiting for new investment. But there were other things to see: the action was at the outdoor diamond market. Row upon row of diamond sellers. They put up with my camera assuming I was a potential buyer. There were many rows of these small-scale open-air diamond merchants. I couldn’t help but wonder how many of these had been mined clandestinely on the MIBA concession. I was told that the outdoor market was only for diamonds from 0.5 up to about 4 carats. The open-air diamond market was just next to the open-air food market. 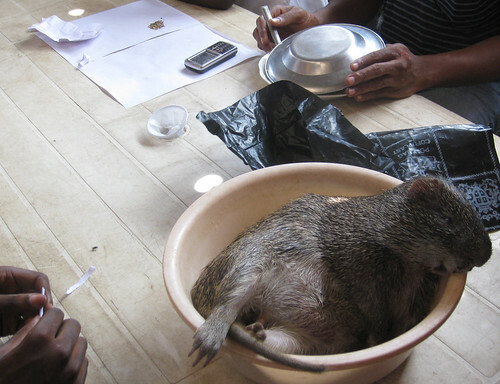 Bushmeat, of course, was for sale. The class just above the open air market for these artisanal gems was the indoor dealers… Here I was casually told that they deal with 30-50 or more carats, including gem quality stones. I did not venture into any of these shops. That was beyond my class. Both diamonds and dollars adorn the wall of this up-scale diamond merchant. 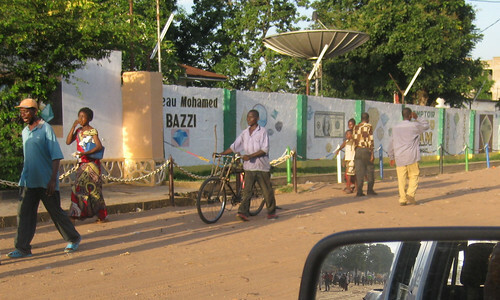 To answer my question: there are plenty of friends of diamonds in Mbuji Mayi – all men – and regularly some lose their lives for diamonds, perhaps tangled in electrical wire around the MIBA concession, or perhaps shot by MIBA’s guards, or perhaps a shoot-out between themselves. Many of the gem’s friends live at bare poverty level and maintain hope of something better as soon as they find that 30 carat stone. This entry was written by Terese Hart, posted on 2009-05-23 at 1:51 pm, filed under About the project, Diamonds, gold and guns. Bookmark the permalink. Follow any comments here with the RSS feed for this post. Post a comment or leave a trackback: Trackback URL. 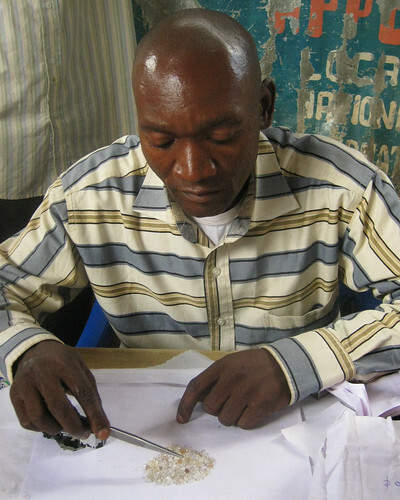 >A third of the world’s industrial diamonds come >from Mbuji Mayi. After World War II, it was the >number one producer worldwide. *Those are astounding figures (a bit like the DRC being a big source of uranium). So who is buying the diamonds from the market? Middlemen? I imagine middlemen. People who will either take them to Europe or sell to someone else who will take them to Europe. I did not trace the path of the parallel market, but it would be very interesting to know it. Perhaps the sort of project that World Resource Institute would undertake -? I am working for the National belgian television. As you know, Congo has been a colony of Belgium and given the fact they will celebrate their 50th independence anniversary next year, we are making a whole series of documentaries for the belgian TV. I am working on kisangani and Oriental and would like to get in touch with you to ask you more questions about bonobo’s, pygmies, wildlife and congo in general. Do you have an email address where I can reach you? 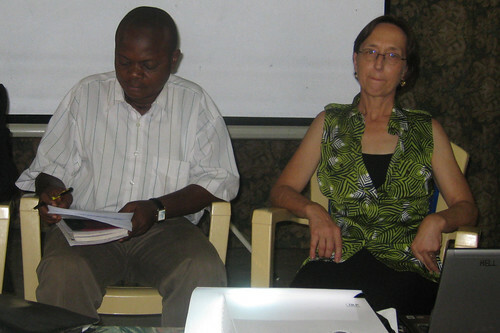 Wy wife Suzanne and I were teachers in Mbuji-Mayi from 69 to 71 with Canadian University Service Overseas and really enjoyed our experience. A lot is difficult to explain… and I recommend reading the 135 page book LA PHILOSOPHIE BANTOUE by PLACIDE TEMPELS published in the 1940s. You are of my generation. I also first came to Congo in 1974 to teach. I was a Peace Corps teacher (but only at secondary school level) for two years in northeastern Zaire and loved it — taught biology, chemistry and, of course, English. I also do remember reading — way back — la philosophie bantoue. Still love it here…although la philosophie capitaliste (perhaps with a Bantoue twist) is in full swing and (to my dismay) the philospohie environomentaliste is generally pretty low on the list. Dear sir/madame i just want find out how to buy diamonds in Congo, your faithfull badibanga. i woul like to know where the most wanted and valued diamonds in mbujimayi are. i want to buy the Rough Daimond . mireille mbu i have been looking for opportunity to come to mbuji mayi pulposely to buy diamonds,kindly may you connect me with honest and rightful merrchants from mbuji mayi please. Iam in indian. Two time arrive in kinshasa but not a real seller given my party.iam very intersted inths busness.pls arrange the any type of rough.